12/08/2005 - LANGLEY AIR FORCE BASE, VA (ACCNS) – The Air Combat Command dining facilities at Langley and Mountain Home Air Force Bases stood above the rest by demonstrating to evaluators they’re ready to compete in the Air Force’s 50th Anniversary of the Hennessy Awards. Established in 1956, The Hennessy Award Program is an annual competition for bragging rights of the best food service program in the Air Force; essentially, the Super Bowl for eateries in blue. Association and Air Force officers. customer service and meal quality. Additionally, it’s designed to inspire high morale, motivation and a professional image through pride and competition. The awards are based on the entire scope of an installation’s food service program exhibiting excellence in management, force readiness support, food quality and more. Not just any facility demonstrating these virtues can compete at the Air Force level; they must be selected as the best at the major-command level. “It’s the bases that choose to compete and shoot above the standards that are nominated from ACC,” said Sergeant Lohenitz. According to Senior Master Sergeant Joseph Hayes, ACC Food Service Manager, bases are evaluated in two categories: multiple and single. The multiple-facility category includes bases with two or more dining facilities serving breakfast, lunch and dinner Monday through Friday. 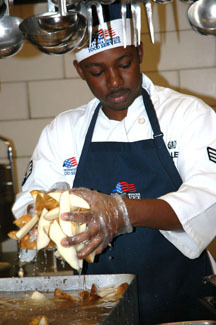 The single facility category includes bases with only one facility serving three meals a day on weekdays. Langley’s food-service program was nominated as the single facility and Mountain Home was nominated as the multiple. The last time Langley won the Air Force Hennessy Award was 1992, when it was a part of Tactical Air Command. Mountain Home has yet to claim rights to a Hennessy trophy. A victory this year is more than an appealing feat for those competing, said Sergeant Hayes, because it’s the 50th Anniversary for the Hennessy Awards. “We have a great staff with a lot of young folks full of energy,” said Tony Skwirut, Food Service Officer, 1st Services Squadron, Langley. It’s those young Airmen at Langley who will be holding the torch when Air Force evaluators come through in early 2006. The ACC evaluators noted both bases exceeded standards, but each boasted different strengths. According to ACC Services officials, Mountain Home was selected based on their customer service, meal quality and supportive leadership. The facility demonstrated substantial improvement from last year’s operations. Moreover, the customer feedback has resulted in a massive variety of food. The Air Force requires all dining facilities to operate from a 14-day menu, standard across the board. According to Master Sgt. Henry Brown, 1st SVS dining facility assistant manager, the Langley facilities go far beyond the 14-day menu. He said their food variety exceeds standards by offering special foods on certain days and extra food displays, like deli bars, every day. In addition, they host a food show twice a year. Despite their success at the MAJCOM level, food specialists at Langley offer a modest response to their proven skill. On the whole, the facilities have two things in common: quality customer care and supportive leadership. Both bases were able to exceed the needs of the customer because of the financial support of their leadership. At Langley, the facilities welcomed more than $60,000 support from the 1st Fighter Wing. Mountain Home gathered a substantial sum as well. Both Mr. Maddox and Mr. Skwirut and those who work for them said their efforts are primarily for the customers -- winning the Hennessy award would only be a bonus. “Win or lose, we are still America’s first team,” added Sergeant Haviland. The Air Force evaluating team will start traveling to evaluate all nine nominees Jan. 29, said Sergeant Hayes. The winners should be announced by mid-April.